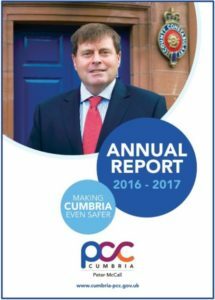 Cumbria’s Police and Crime Commissioner Peter McCall, has today launched his first Annual Report. The Commissioner has a statutory responsibility under the Police Reform and Social Responsibility Act to produce an annual report as part of the public holding-to-account role. The Annual Report covers the period from when Mr McCall was elected on 12 May 2016 to 31 March 2017, and sets out how he has carried out his statutory functions, such as setting the budget, developing a Police and Crime Plan and holding the Chief Constable to account. Peter McCall said: “I am delighted to launch this, my first Annual Report, in which I have tried to capture the essence of how I have engaged with you, the public, along with partners and stakeholders, to help identify Cumbria’s policing priorities, and shape my Police and Crime Plan. As I have said before, your priorities are my priorities. “I hope, too, that I have managed to convey how important it is that we all take some responsibility to help keep Cumbria the safe place it is. We need to work together in our communities to help to prevent crime and anti-social behaviour, and I am doing what I can to help facilitate that, through provision of funds such as the Community Fund and Property Funds. In my Annual Report you will read many great examples of how this is working on the ground, and importantly, what a difference it is making to people’s lives. “I will continue to examine how the police are performing and whilst there are some areas that I have asked the Chief Constable to focus on, I am pleased that Cumbria remains a safe place to live, work and visit. This is supported by the many positive assessments that we have had from Her Majesty’s Inspectorate of Constabulary during this last year. “I am aware of the need to improve 101 response times, this is probably the most common complaint I deal with. The constabulary are working on this, and I know they are investigating the use of web chat and other means of contact. It is also possible to email non-urgent reports and enquiries, which is much more efficient and avoids delays. However, I will continue to monitor this very closely. Alternatively, contact the office on commissioner@cumbria-pcc.gov.uk or call on 01768 217734 for a hard copy.